We stayed at the Radisson Blu for an overnight stop in between lengthy flights. One of the reasons we selected it was its location close to the airport as well as being next to the Creek where we could walk around and stretch our legs. 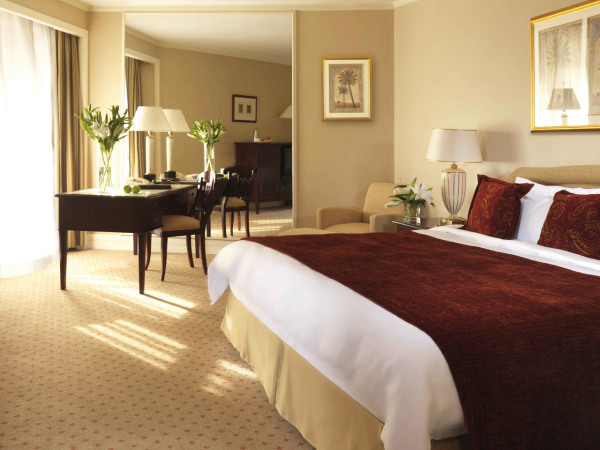 Another reason were the spacious and classical style rooms that we felt would allow us a rejuvenating rest between the long flights. Upon arrival, we were cordially checked in by well trained staff. There was a slight delay in the check in as the counter was inundated by other customers checking in at the time. However, there was no rush in the manner of the staff and their welcoming smile remained as they efficiently dealt with everyone. The hotel was one of the first premium hotels built in Dubai in 1975. So the exterior is constructed in this style, but the inside has been renovated throughout. 9 restaurants and a handful of stores are part of the property, including one restaurant that is open 24 hours. The smaller building next to the main hotel building houses the large fitness center. In the fitness center are a gym, squash courts as well as male and female saunas. In between the 2 buildings sits the hotel swimming pool. It is medium size, unheated, deep in the middle and has a number of sun chairs around. However the pool is in the open with little shade, except from the main building in the morning. 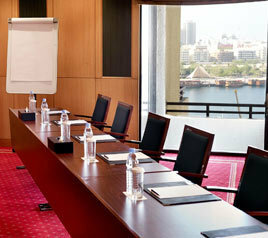 The Radisson Blu in Dubai Deira Creek is an excellent choice for events and business meetings. The fact that it is close to the airport and a major metro station give it great access to other parts of the world or the city of Dubai. There are a total of 12 meeting rooms, that range in size from a 30 to 1200 guest capacity. All meeting rooms contain conference equipment and can be catered as required. The Free Wi-fi is dependable and is available throughout the inside of the hotel. For more detailed information regarding all their service, including fitness club hours, follow this link to their services page . On the website, the Standard rooms are advertised as being 30 square meters and although we did not accurately measure it ourselves, based on our observations this was a reliable representation. The overall style is slightly dated, however it is not old. The room was clean, modestly decorated and included soft, blemish-free carpet for the flooring. In the room you will find a table and chair with a lamp and phone, as well as ample power sockets, perfect to work on the laptop. There is also a TV stand with a bar fridge and drawers for storage. Lighting is gentle and thoughtfully located, with one lamp on each bedside table as well as on the TV stand. The bathroom was clean and of adequate size. The shower was in a bath (not free-standing) and the water pressure was strong with the temperature being comfortably regulated. There was one sink and two mirrors - one main one fixed to the wall and the other was a round vanity mirror. As for the bed, the mattress was a full queen size and its firmness was conducive to a restorative sleep. At the time we visited, the hotel still had a pillow menu, offering 4 different types of pillows. However, speaking with them recently, I was informed that as of June 2017, the only pillow options are feathered, or hypo-allergenic pillows on request. Every room has access to a balcony which is very small. On the balcony are two chairs and a coffee table, but you can't move around much due to the size. 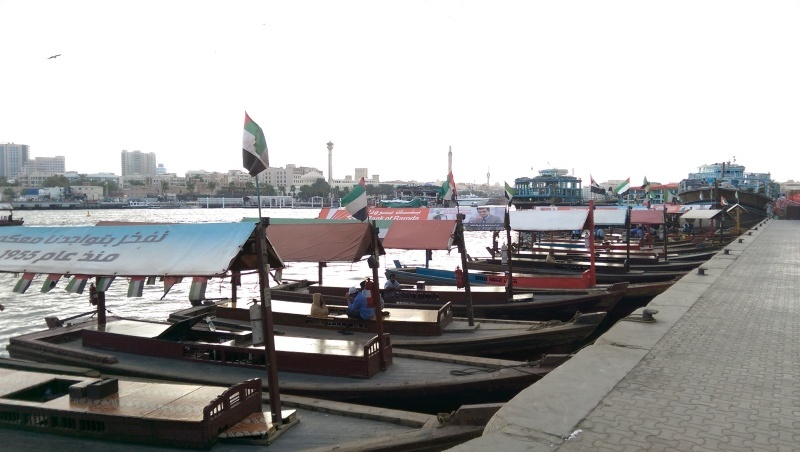 It was though, a refreshing place to feel air moving and observe the creek as it buzzed with activity with people walking alongside it, as well as from the arriving and departing dhows. 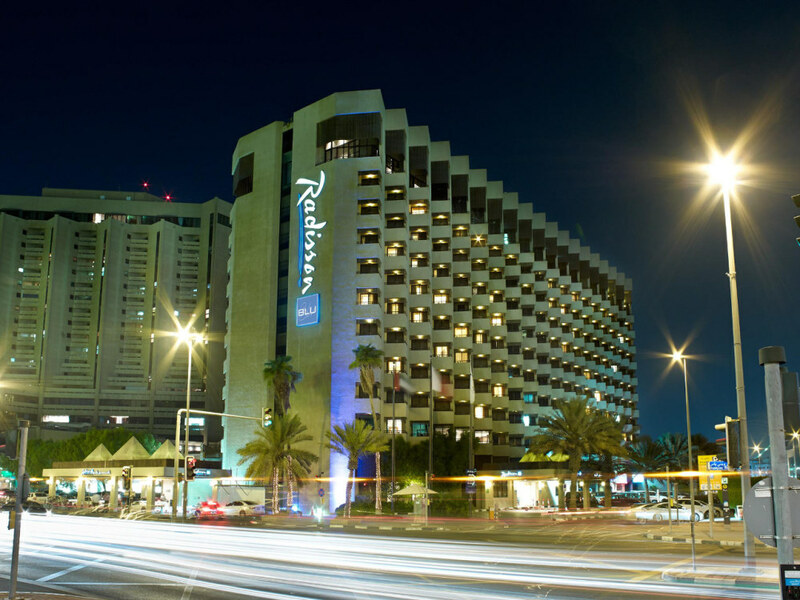 The Radisson Blu Dubai Deira Creek is situated on the northern side of the Dubai Creek, 7 kilometers from the airport. The closest Metro station is Union Station, which is really convenient as it serves both the Green and Red metro lines. From the Airport Terminal 3 station, take the Metro Red line 5 stops to Union Station. From here, it is less than 500m (6min) walk to the hotel. The creek beckons right across the road from the main entrance and there is a wide path that takes you along the creek. Here you can see traditional dhows, with their crews at work loading and unloading goods into trucks. There are a number of restaurants here, both on the waterfront and on boats. Further down are the Old Dubai markets, where you'll find store after store selling goods like textiles, kitchenware, dates, luggage, and many other goods, mainly in bulk quantities. Across the creek are historical buildings, but you'll either have to take a water taxi or walk a long way around as there are no bridges in this area crossing the creek. The purpose of our stay was to get a refreshing sleep between long flights as well as to be able to walk around in the Old Dubai area. Was this achieved? Yes it was, and we would definitely consider staying here again the next time we're in Dubai. The staff were neither intrusive or neglectful, which enabled us to savor our peace away from noises and excessive attention. The room was sufficiently spacious to allow us to move about with ease, although it would have been nice to be able to sit and relax on a larger balcony. 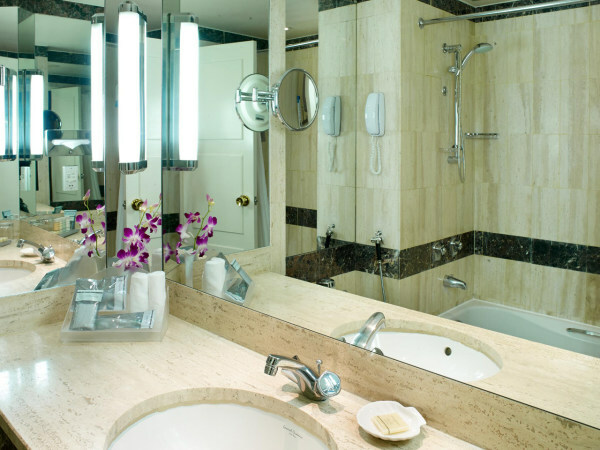 Freshness and tidiness of the room and bathroom revealed a well-maintained and managed property. It gave us much enjoyment to be able to walk by the Creek and be immersed in the trading world of Dubai, away from the extravagant mega malls and skyscrapers of Downtown. After an invigorating hour at the gym and in the pool, we enjoyed a restful sleep, ready for our flight in the morning. We cannot comment on the restaurants as we did not visit them, however their appearance and cuisine appeared to be of high quality. The tribute they pay to the hotel's history as well as leaders of the Emirate are demonstrated in the murals on the walls and in the lobby area. We found them thought-provoking and added character to the property. This hotel is ideal for business travelers as well as people looking for practicality and comfort. Guests who appreciate being on the move will also benefit from staying here due to the ease of getting about in the city from this location. There are plenty of amenities to suit your travel needs and are important for a pleasant stay. 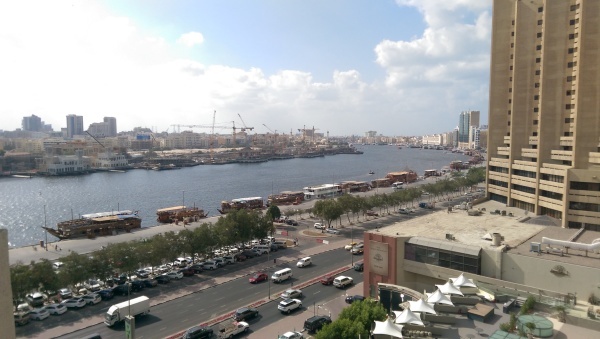 Have you stayed at Radisson Blu Dubai Deira Creek and want to share your experience? Or do you have a question about the hotel or about Dubai overall? Let us know in the comments below!